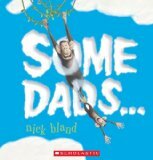 Some of our favorite picture books about fathers and fatherhood together with free printables and a link to our Father’s Day board on Pinterest. Dad and Pop: An Ode to Fathers and Stepfathers is the story of the two special men in a young girl’s life. Outwardly they are very different. They wear different clothes and they have different hobbies but, there are also similarities between the two men. Both teach the girl to how to cook and both enjoy music. Pop is bald. Dad is not. Dad is tall. Pop is not. Dad wears suits. Pop wears boots. Pop takes pictures. Dad takes naps. This breezy, happy look at a family that includes both a ‘Dad’ and a ‘Pop’ celebrates differences and commonalities. A good choice for children aged four years and up. Bright, cheery illustrations depict a baby girl and her father. As the day unfolds, they share all sorts of affectionate, happy moments. A great choice for infants and toddlers, Daddy Hugs 1 2 3 is all the more special because it shows a dad who takes responsibility for all aspects of his daughter’s care. Such a lovely story – an excellent choice for preschool storytime or a bedtime story. Each Friday, a young boy and his dad leave their city apartment and walk through the bustling streets. 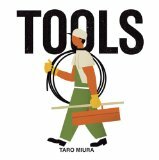 They walk past shops and building sites, people rushing to work and people who are already going about their business. Eventually they arrive at a familiar diner. They sit together in a booth, enjoy breakfast, chat and watch the world go by. Their happy relationship and joy in being each other’s company is clear and very endearing. would you know me then? Daddy reassures his son that no matter where Jeremy might hide, he would find him. Reminiscent of The Runaway Bunny, I’d Know You Anywhere concludes with Daddy and Jeremy disguising themselves and sneeking up on mom. Ruth Ohi’s illustrations do a lovely job of depicting the playful relationship between father and son. The story is best suited to very young children, aged two and up. A lovely picture book, Little Boy is a celebration of play and a reminder – especially for adults – that small moments can have great meaning and impact. We watch from morning until night as a young boy plays with his dog, enjoys time in the out-of-doors, has fun with a large cardboard box, helps with cooking, plays with his toys and spends time with his dad. Note,although the adult male in the illustrations is not specifically named, we assume he is the boy’s father. Little Boy is a great gift book for expectant parents and also dads. Do take time to enjoy Peter H. Reynolds’ illustrations. Each page tells a story and children will enjoy watching for the boy’s toy robot and his yellow cup as they accompany him throughout the day. A happy celebration of the relationship between a boy and his father. It is clear that the pair enjoys spending time together and they have fun adventures – flying in a small airplane, snorkeling, riding bikes, painting and studying insects. All the while, the boy is learning from his father. Mr. Jorisch’s joyful illustrations capture emotions and the the pair’s close relationship. Will be enjoyed by children aged four years and up. In 1988 the Caldecott Medal was awarded to Owl Moon. A special 20th anniversary edition is now available and provides an opportunity to discover the picture book’s wonderful, timeless magic. It is very late at night when a father and his young daughter venture into the cold. They are seeking a glimpse of a great horned owl. The companions walk together silently and eagerly under an Owl Moon. Beautifully illustrated, this is a remarkable book that will be enjoyed by the entire family. The depiction of the young girl’s excitement will no doubt inspire parents to bend their bedtime rules and enjoy a moonlit, late night walk. In his cheery tribute to fathers, Nick Bland depicts all sorts of animal parents exuberantly interacting with their offspring. We laugh at an over-protective elephant papa who fills a swimming pool with life rings and a mischievous sheep who can’t resist throwing a water balloon at his child. Readers, both young and old, will enjoy the playful rhyming and the jubilant illustrations. Some Dads… is an excellent choice for Father’s Day or Dads’ Day at preschool, delivering a fun and affectionate message about diversity and unconditional love. And some dads rock ‘n rolling. And some dads just love the outdoors. Well suited to children aged two and up. Beautiful pastel illustrations are the highlight of this tribute to animal fathers and their offspring. Children will enjoy looking at a variety of male mammals, amphibians and birds as they feed, groom, house, protect and play with their offspring. Some tuck you in, safe and warm, when the sun’s about to go. And my daddy… haven’t you guessed? From all of the daddies, tall or small, mine is the best, the very best, the very best daddy of all. Great for children aged two years and up. An energetic, colorful and imaginative look at what Daisy’s dad does when he is at work and she is at school and playing with her friends. “My daddy is an explorer!” said Daisy. Best suited to children aged four and up, older children will have fun with the author/illustrator’s treatment of Daisy’s interpretation of Daddy’s job description. Note, onomatopoeia (Nee Nar, Nee Nar, Nee Nar / Boom Boom) is featured. Step 2 – Pin this page, bookmark this page, share this page, “Like” us on Facebook or sign up for our newsletter. 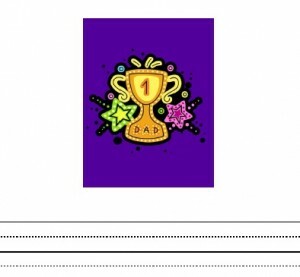 Step 3 – Choose from any of our 250 free downloads, including these free Father’s Day printables. 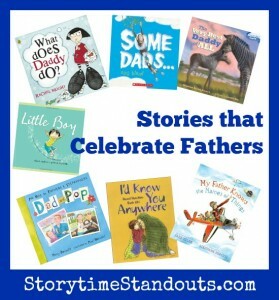 Follow Storytime Standouts’s board Father’s Day for Preschool and Kindergarten on Pinterest. And some dads rock’n rolling. At first peek this appears to be a book for very young children. It features bold illustrations and large text. I have shared it with a number of grade one and two children and found it very engaging. Showing us all sorts of equipment used by carpenters, tailors, mechanics, doctors, chef, gardener, etc. We first examine the implements and then are shown who might use them. This guess who format together with the extensive array of fascinating items makes the book entirely appropriate for early primary and a great resource for vocabulary building. Ruth Ohi’s illustrations do a lovely job of depicting the playful relationship between father and son. The story is best suited to very young children, aged two and up.